Like I said in my last post I have been feeling creative and inspired by the crisp, fall weather. I babysit every afternoon and I walk home afterwards feeling light-footed and eager to find cool bits of nature. I feel like a racoon who is attracted to shiny objects and hoards them in his lair. My roommates can attest to the fact that almost everyday I come home and unload my pockets or book bag of some sort of natural debris or trash. 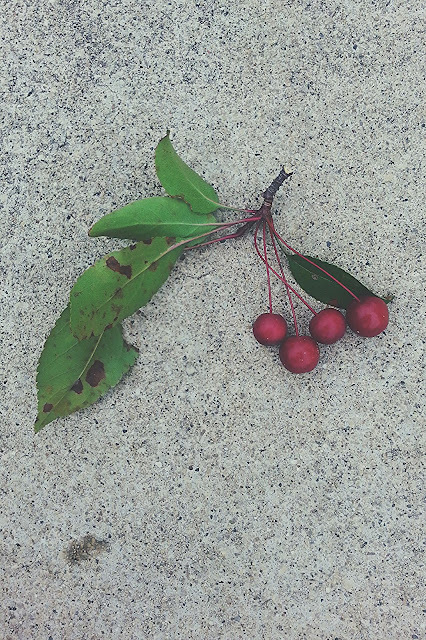 What follows are three of the pretty nature things I found on one of my post-babysitting walks. 1. Blue wood-chips: These wood-chips are jewel toned and speckled. What could be better? I found them outside one of the preschools in town. I suspect that the children were doing some sort of paint-splattering art project. I have no idea what the results of the official art project were, but the residual effect was this collection of heavenly chips. 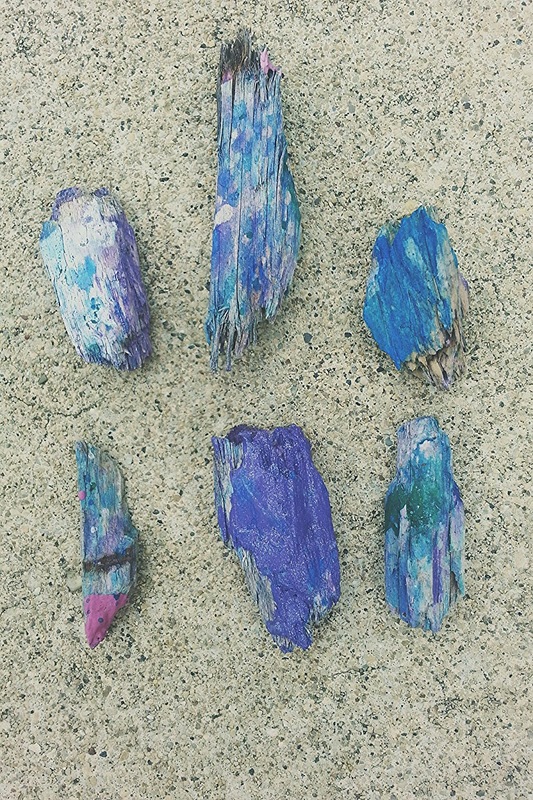 I could see these being repurposed into one of those chunky necklaces that an art teacher would wear. Oh! 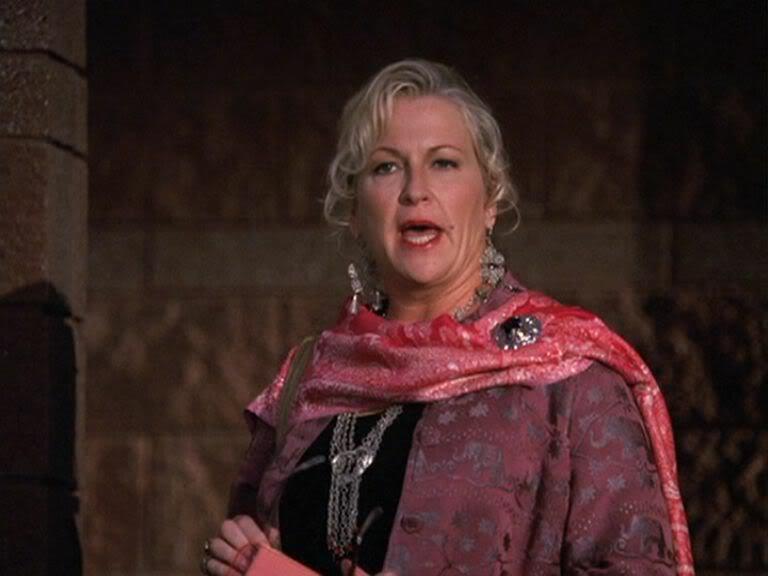 I know who would wear the wood-chip necklace: Mrs. Darbus, the drama teacher from High School Musical. I know this because if you remember, that was my favourite film during middle school...sort of. 2. 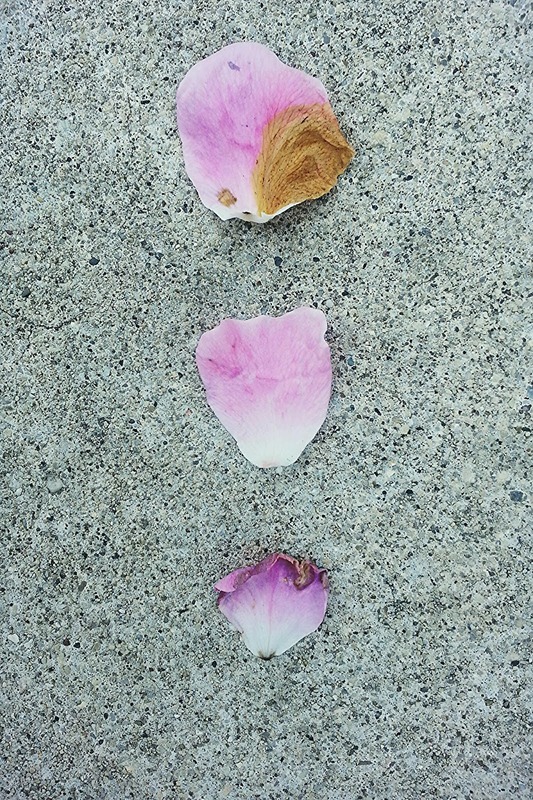 Rose Petals: These lovely things do not require explanation. Everyone knows the connotations that we have with lovely rose petals: romance, fragrance, delicacy, nostalgia etc. Recently my Media Studies professor talked about the way that names or words affect the way that we think about objects. He claims that Shakespeare's famous line from Romeo and Juliet, in which Juliet claims that "A rose by any other name would smell as sweet", is untrue. According to him, we would all be a lot less crazy about roses if they were called something else, like petunias. He believes that the power of the actual word "rose" contributes to the amount of sentiment surrounding the flower. In conclusion: I love roses and I like how these particular petals are slightly decaying. The colour of their dry, dying skin is an ochre yellow, which contrasts interestingly with the candy pink. 3. 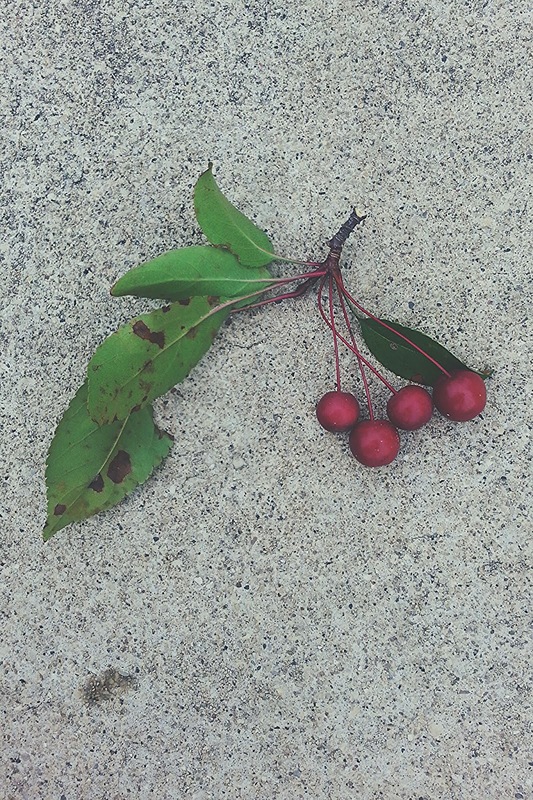 Crab-Apple-Like-Things: What can I say about these? Not much. 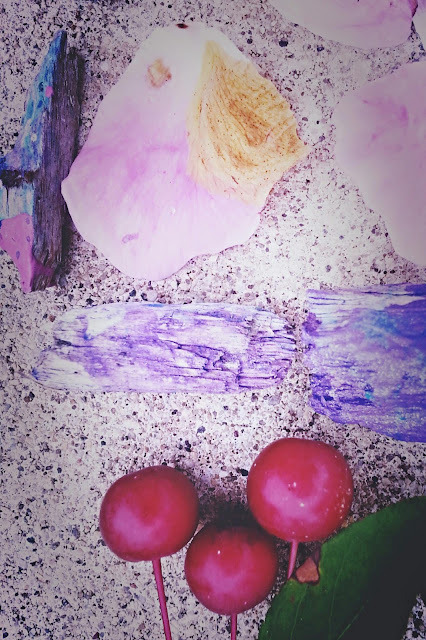 I just liked their colour so I pulled them off the tree. They remind me of crab apples. When I was little and we still lived in the suburbs of Chicago, where they have a lot of crab apple trees for some reason, I was enthralled by them. I always wanted to stop and pick a few off the sidewalk. I wanted the tiny apples because I loved all things miniature. I pictured my dolls eating them at tea-time. I would always be tempted to taste them. And even though I always expected them to taste like delicious tiny apples they always tasted sour and nasty. My mom was always right when she said, "Honey, don't eat those." Look here for last week's Three Things when I talked about comic books. If you have even more free time look here to find the post about three unusual couples.